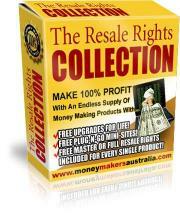 Interested in making massive amount of money from resale rights? Read on to discover the secrets to easily transform cheap resale rights products into money-pumping machines anytime you desire...plus a chance to download $9,700+ worth of resale rights products absolutely FREE -- but only if you're quick enough! "Discover How To Instantly Pull Massive Profits And Bank In More Money From Simple Resale Rights Products Available Everywhere...In As Little As 72 Hours And Even If You're Starting From Scratch!" - especially if you're selling the exact same products as them! "MUST-READ For Anyone Buying And Selling Resale Rights!" Ewen, just wanted to drop you a quick line to say GREAT JOB with "Resale Rights Secrets"! of gold in your manual! It gets my highest recommendation! Listen, would you like to take average "dime a dozen" resale rights, and learn how to make $10,000 or more by using hidden expert techniques for marketing these products like crazy? Even better, would you like to discover the closely held secrets and even some dirty tricks that will show you exactly how to get more money (lots more) selling resale rights, regardless of how many other marketers might be selling the exact same product? The obvious reply would be an excited, pulse pounding "yes!" if you want a fast, effective and inexpensive method to quickly make some real money online! In fact, I can now take any resale rights product and make at least 3000% in pure profits selling it to a hungry market of eager buyers…all in less than 72 hours – and YOU can too! …Why? Cause it pisses me off just to see another lie or myth propagated about it being too hard to make money with resale rights, that's why! YOU can now finally skyrocket your own resale rights sales and profits through the fire-burning roof…even if you’re just starting from scratch! "Generate Income In Less Than 72 Hours!" If you would like to know how to generate income in less than 72 hours, then this is the most important ebook you will *ever* read. Proven methods as well as revolutionary concepts (even a few dirty tricks). You name it, this ebook has it all. "Rare, Unique And Quality Product!" Ewen, it's rare to find experts going into so much detail of the methods they have actually used - like one author who gave his hour by hour account of how he set up a successful resale rights campaign in 72 hours! Once again you have produced a unique quality product. Resale Rights Secrets: How To REALLY Pull Massive Profits From Resale Rights In As Little As 72 Hours --Guaranteed! "19 Experts Reveal All There Is To Know About Making A Fortune With Resale Rights Products...All The Amazing Secrets, Powerful Strategies And Even Some Dirty Tricks Are Finally Revealed In "Resale Rights Secrets" -- The First And Only Resale Rights Marketing Blueprint Ever Released On The Entire Internet!" You're getting exclusive “secrets” never before revealed along with the comfort of knowing you're discovering them not from just one -- but nineteen super-successful experts in the resale rights industry! "A Goldmine Of Knowledge And Experience From Some Of The Sharpest Resale Rights Experts!" Hi Ewen, your "Resale Rights Secrets" blueprint has just blown the lid off this very profitable way to make money on the net. It's a goldmine of knowledge and experience from some of the sharpest resale rights experts I know. Quite frankly, I'm amazed that you got them to reveal all their personal secrets to using Resale Rights to build a terrific income stream fast. Terrific job, once again! "My Head Was Whirring With Ideas..."
Ewen, I planned to review your ebook in an hour... and before I realized, FOUR HOURS had passed! Pages of notes littered my desk. My head was whirring with ideas. And new avenues of profiting from resale rights opened up in my mind. You've compiled an amazingly helpful resource - anyone thinking about using resale rights intelligently will benefit from it. Now I'll be busy putting this knowledge to use. Which Of These 19 Experts Can You Grill And Use As *Real-Life Case Studies* To Literally Guarantee Your Own Resale Rights Success? Allan is a resale rights veteran and operates the very popular Reprint-Rights-Marketing.com where he provides a huge range of resale rights products and purchases every eligible newly released digital product that comes onto the market for his members. Bob is a successful Internet entrepreneur and has created many of his own very popular resale rights products. He runs OmniWebMarketing.com, a premium internet marketing club. Bryan is a full time online marketer who used to work in a factory making $27,000 per year. He now works from home and make many times that amount per year! He's best known for PushButtonPublishing.com, an all-in-one internet marketing solution site and also PushButtonLeads.com. Bryan has recently launched a revolutionary peer-to-peer traffic system with Jerome Chapman at MillionDollarTraffic.com. Dan started in direct marketing in 1962 at the ripe age of 10 years old however now, most of his activity is focused on providing resale rights opportunities to other business site owners. He has created many popular resale rights products like "Ezine Ad Solutions" etc. and has recently launched Sales-Writer.com and SlideInADSGenerator.com to provide more solutions to business owners. Eva Almeida is a founding member of the International Council for Online Professionals at I-Cop.org and web owner of the immensely popular eBooksNBytes.com. Online since 1998, her internet expertise is centered on ebooks with an entire collection of sites and newsletters on the topic. She's also the publisher of "eBooks N' Bytes Informer" newsletter, the "eBook Broadcast Bulletin" and "eBook Reviews Weekly". Fabian is a management/internet marketing consultant with 7 years of global management consultancy experience advising MNCs across various industries. He recently started BizSuccessOnline.com in 2002 with the aim of helping organisations and individuals succeed online. Fabian's also the editor of “Biz Success Tips”, a no-hype, no B.S. online newsletter! Gary Huynh is known for taking the knowledge of internet marketing gurus and synthesizing their techniques into new and unique ways of marketing. He's the creator/author of RebrandProfits.com and ResellMasterCourse.com, two powerful solutions that can skyrocket anyone's profits with resale rights. Gary runs Real-Internet-Marketing-Reviews.com where he provides honest and thorough reviews of internet marketing products, plus an ezine “Marketers Review”. Gauher Chaudhry is the President of iPromote Media Inc. and an active marketer for the last fourteen years of which seven of those have been spent marketing online. Gauher has authored numerous ebooks that come with 100% master resale rights like NetGurusSecrets.com, AdGladiator.com and AutomaticGoldmine.com. James is the CEO of AESoft providing programming and software solutions to online businesses. He's also the webmaster and owner of Tools4Affiliates.com and is extremely successful in the resale rights business, quietly making a fortune with his unique take and strategies on resale products! Jo Han needs no introduction. He's a frequent guest and featured speaker at Internet Marketing bootcamps and conferences on subjects such as copywriting and Joint Venture Marketing. He specializes in showing you 'simple but unorthodox shortcuts' that you can apply to your marketing immediately to explode your sales and income. Jo Han's recent works include "The E-Code" co-authored with Dr Joe Vitale and his breakthrough traffic generation system over at InstantVisitorSurge.com! John Delavera is the mastermind behind The Internet Company® (TIC), a relatively new company in the Internet Marketing area. He's well-known for creating innovative inventions and products and is an expert resale rights and viral marketer. Some of John's unique products include "Turbo Referer", "Special Offer Manager" and "JV Manager". He's also the creator of "Best Free Ebook" and "Best Seller Ebook", two products taking the resale rights industry by storm! Keith began selling services online in 1998 and hasn’t stopped since. In 2000, he discovered his formula for generating over $200,000 per year in net income and has been moving forward ever since. Keith started a free site in 2003 to help others end their confusion in marketing by launching the very successful site, MarketingProductReview.com. He's an expert in joint ventures, starting and selling sites, and building massive Ezine lists, someone anyone can learn a lot from. Mason Ramm is a successful online marketer and also the creator of the Resale-Rights-Collection.com website. He publishes the popular ezine "Little Known Money Makers" Ezine which exposes the little known ways people are using to make money! Mike Filsaime uses strategic marketing techniques to make over $10,000 per month online from his many websites. He's the creator of "The Best Deal Ever" over at The-Best-Deal-Ever.com, an awesome package of over 367 products and 336 resell rights licenses worth a total of $12,446 for a one-time investment! Other websites he runs include Carbon-Copy-Marketing.com and Dont-Touch-My-Ads.com. Priya's a Health & Environmental Journalist and Work-At-Home Mom who has been successfully making a living online since 2001. She's the creator of the "Genius Guides™" - a unique set of resale rights packages at GeniusGuides.com. Priya has also authored "Be a Whiz at eBiz", "Article Magic," plus many other publications featured on her site, EbizWhiz-Publishing.com. Russell is the owner of an online company called SublimeNet and runs 15+ of his own websites. He has created many new amazing marketing software products, including ZipBrander.com which has literally changed the way that software and ebook resell marketing is done online. Russell is indeed a force to be reckoned with and you'll be seeing many more innovations coming from him soon! Are You Itching To Learn Their Amazing Secrets And Powerful Strategies For Producing “Eye-Popping Profits” With Any “Dime-A-Dozen” Resale Rights Product? In fact, you'll find it to be the exact kick in the rear you need to get your sales (and profits) chugging away like a super-speed locomotive! Each expert was grilled on some very revealing questions producing deep-rooted secrets and techniques they themselves were shocked to realized they had given away – after the interview! What could you achieve with the hidden answers and ultimate knowledge to these interview answers? Could you profit like crazy from your own resale business if only you knew the answers to these questions, as revealed by each expert in “Resale Rights Secrets”? The TOP THREE “Profit-Exploding” Resale Rights Strategies You Can Copy-And-Paste From For Similar Success Instantly! 19 Surefire Strategies To Generate Instantaneous Profits With Resale Rights In As Little As 72 Hours! How To Outmaneuver, Out-Market And Out-Sell Every Competitor In The Long-Term…Using Certain Advanced Strategies Completely Unknown To 98% Of Them! "Resale Rights Secrets" is a complete blueprint on resale rights marketing revealing awesome secrets and killer strategies YOU need to know! A No-Brainer Secret For Building A High-Profit Email List Of Hungry Customers -- So simple, yet so rarely used. Learn how you too can start building a list that you market to (and profit from) over and over again! The 2-Step Success Plan For REALLY Succeeding With Resale Rights -- Learn this to help put yourself in an instant profit-producing position! 2 easy steps is all it takes to put yourself ahead of the competition! An Example Of How To Package Niche Products For BIG Profits -- Here's the true secret to outselling everyone else selling the same products! How To Find The BEST Ways Of Getting Loads Of Targeted "Ready-To-Buy" Traffic -- Plus tons of other techniques that can bring you more traffic than you could ever want for! A "Unique Twist" Technique For Outselling Other Resale Marketers Time And Time Again -- And the simple way for you to use this "Unique Twist Technique" to do the same! The Amazing Power Of The "Presell" -- And how you can use it to increase your sales dramatically! How A Few Hours Of Time Can Result In Hordes Of Visitors To Your Site -- Want an explosive means of traffic that lets you spend about 3 hours setting it up, yet brings traffic to your website forever? Learn this super simple technique! What Kind Of Resale Rights Can Make YOU The MOST Money -- Find out, and use it to your unfair advantage. 99% of marketers never pursue this type of right to a product, but it can literally make YOU a fortune! How To Make $300 With 30 Minutes Of Work -- And how you can do this over and over again, whenever a little extra money is wanted (have you made $600 an hour before?). How To Build And Cultivate A Profitable Email List -- And then how to market and profit from it over and over again! So simple .... yet so highly profitable you can't afford to miss this strategy! The Proven Formula For Maximizing Results From Paid Advertising -- Seriously ... don't spend another cent on advertising until you discover this powerful formula for maximizing it! How To Get A Real Shot At Creating Profitable Joint Ventures With Top Gurus -- Thousands can be made this way ... and you'll see how a complete newbie to the marketing world can do to entice heavy-hitters to market his/her products! The Most Important Secret That Will Make Or Break Your Resale Rights Business -- Are you doing this right now? If not, it could mean immediate failure for ANY product you try to market! An Ultra-Effective 3-Step System For Profiting From Resale Rights In 72 Hours Or Less -- Learn it ... use it ... profit from it! How To Get A Truckload of Affiliates Selling Your Products For You -- And best of all, you even get a complete letter template you can copy that has proven extremely successful for signing up new affiliates by the boatload! How To Use 'Guerilla Marketing Tactics' To Announce Your Products To Hundreds of Thousands -- And makes them eager buyers! A Hidden Secret For Breaking Free Of Resale Rights Competition And Building A Long-Term Profitable Business-- A plan no one marketing resale rights should do without! PLUS too many insider tips and techniques to ever reveal here...you can't afford to miss a single one of them! "Pure Genius And A Masterpiece!" What you're going to find in "Resale Rights Secrets" is pure genius from nineteen of the web's most experienced resale rights experts including names like my old friends Jo Han Mok, Bob Bastian, Bogdan Ravaru and many others. infinitely more knowledge and wisdom than I had when I started. Thanks, Ewen, for creating something VERY special. I'm going to put it to good use and look at repackaging some of my Internet offerings using the knowledge I gained! "Complete Uncensored Content - A Real Winner!" Ewen, This is a real winner! I've never seen a manual on resale rights marketing as complete as this. And you're actually right about the uncensored content. The experts really went all the way to reveal their top secret tricks. Well done - it's something I'll refer a lot too in the future! "So Clearly Outlined And Nothing Held Back!" You Can Make A Fortune Simply By Using These Strategies And Your Resale Rights Products-- Starting Immediately! I'm not talking months from now -- but immediate profits! No more guessing at what works ... no more wasted time "spinning your wheels". You get it straight from the expert's mouth and learn exactly how they get boatloads of traffic and sales using other people's products. You see, some of these marketers are making a strong six-figure income selling resale rights -- and they're going to teach you exactly how they're doing it. Meaning, this information could very well be worth $10,000 ... $50,000 .... even $100,000 or more to your business over the next year. But I'm not going to charge you anywhere near the true "value" I believe this information could be worth to your business. Instead, for just $97 $47, you get everything you need to become a serious resale rights marketer in 72 hours or less. You'll never find this information anywhere else. And if you're serious about making a full-time income with resale rights, doesn't it make sense to learn from those who are already living the dream? Nothing has been withheld. You're getting it straight -- every little secret these resale right experts use to make a literal killing can be yours. And to prove the very real value of this information to you and your business, I'm even prepared to GIVE YOU 11 EXTRA BONUSES to sweeten the deal! Yes, You Read That Right -- Order Today And I'll Give YOU *11* "Smack Me On The Head, You're Insane!" *Super Exclusive Bonuses* Right Away! * How to Crush your competition in the crowded resell rights marketing arena...without spending an arm and leg in advertising! * The real truth about making money reselling OTHER PEOPLE'S PRODUCTS ...and more! * Discover Six Proven-Profitable Ways To Make More Money Online By Making More Offers! * Here's how you can set up your own resale rights business from start to finish...even if you're starting from scratch! * Comes complete with easy-to-apply pictures and video tutorials! At Last! All The Breakthrough Software You've Been Looking For! * Instant Site Maker: Creates Stunning Profit-Pulling Mini Sites For You Automatically! * Instant Sale Site: Frank Kern's 'Pre-Formatted' Sale Site Software, Includes Complete How-To Video Tutorials! * Web Army Knife: Adds Secret Cash-Generating Tools To Your Website Instantly! "800 WORDS And Phrases That Sell!" of new opt-in leads and make money at the same time. "How To Write An eBook That Your Readers WILL LOVE To Read...No Matter What Format You Publish In"
* This amazing report reveals the truth about ebook publishing every ebook author or marketer has absolutely got to know...this is something no one really talks about! * The package also includes a brand new special report entitled "The PDF Advantage" worth $17 PLUS 9 other bonuses! "The Inner Works On The Call To Action"
* You'll love this! Let me ask you a question: Do your readers act when they read your copy? * Imagine, your sales shooting through the roof simply because you know -exactly- how to get your prospects to take action and whip out their credit cards! a recent 'Web Copywriting Mastery E-Workshop' that he conducted as an exclusive bonus here. * In this lesson, you'll discover how to literally make a lump of 'lifeless clay' leap to life and shout "Yes, I'm want what you're offering. I want it NOW!". You'll discover all the hidden motivators and 'triggers' you need to make your copy 'grab' em by the throat' and make they buy now! "10 Minutes To Pay Per Click Success"
* Learn the 3 Point Strategy that will successfully convert the targeted traffic you generate from pay per click search engines into lifelong customers! * How to use 3 modern-day scientific discoveries to make success easier than failure! * Learn about the Pain/Pleasure drivers, the cybernetic transposition and the Borrow Genius method that will cut years off the learning curve and make you a resounding success FAST. * The specific techniques I used to start and profit $677 from a simple opt-in list in it’s first month online…simply by offering valuable content that subscribers want to know about! * I mentioned in it to do so successfully. Total value of these bonuses alone = a whopping $432.89! I'm going to GIVE YOU resale rights to an ADDITIONAL $9,700+ of cash-generating resale products you can make immediate profits from! It's simple - order now (I mean NOW) and you'll instantly receive your complimentary 'secret passes' into not one, but *TWO* resale rights memberships with $9,700.00+ of resale products - absolutely on me! Be The Next 100 To Order "Resale Rights Secrets" Now And You'll Be Downloading $9,700.00+ Worth Of The Hottest-Selling Resale Products You Can Resell For *100% profits* Instantly! FREE lifetime membership to Russell Brunson's "Free Software Monthly" with hundreds of products to resell for 100% profits! Your membership entitles you to Master Resale Rights to over 100 top selling products with at least 1 new product added EVERY month! a cent if you act now! Amazing Bonuses And Much MORE!" Each Product Includes Master Or Full Resale Rights Meaning You Can Sell Them Individually, Or As A Complete Package For full profits in YOUR pockets! Each Product Comes With A Ready To Publish Website For You To Plug In Your Ordering Details And Upload To Your Own Web Host! More Products Added On A Regular Basis At NO Extra Cost To You! Resale Rights Memberships For FREE Immediately! Time-Sensitive FREE LIFETIME MEMBERSHIP to "Free Software Monthly" - Giving you over $6,500+ of products with resale rights! Grand Total Value Of "Resale Rights Secrets"
Just * $47.00 * - Grab It Before It's Gone! You can get immediate access to the breakthrough "Resale Rights Secrets" manual, all the bonuses plus truckloads of quality products with 100% resale rights worth $9,700+ at a very *special* discounted launch price of just $47.00 if you act now. You MUST Find "Resale Rights Secrets"
Or You Get My "Ewen You Must Be Crazy To Offer This" 100% Money Back Guarantee! How's this for a guarantee? ...And If you don't agree with ALL of these statements -- or you aren't thrilled for ANY reason under the sun -- then I insist on giving you a full and complete refund. This Is Your One Chance To Learn How To Make A Killing With Resale Rights By Recognized Experts In The Business Who Will Confess To Every Brutal Detail of Their Cash-Pile Producing Techniques! Click here for an instant download of the entire "Resale Rights Secrets" package. Once your credit card is approved, you will be taken to a special secure page where you will download everything! Click Here Now To Make YOUR Fortune With Resale Rights! It doesn't matter what time it is or where you are! even when everyone else is selling the exact same product? If you're serious about making money selling resale rights, then don't miss your chance to get a "leg-up" and learn how they do it -- and how you can too - Click now! P.P.S. Order "Resale Rights Secrets" and use these power strategies over the next 90 days. If you don't feel you learned how to get more traffic to your website and how to make massive profits with resale rights than you did all year before placing your order -- then I insist on giving you a full and complete refund - it's that simple! "CLEARLY The Ultimate Resale Rights Blueprint!" Ewen, wow you've done it again! I feel compelled to write to you before I've even finished reading your new book "Resale Rights Secrets". I'm only half way through and have had to put it down to start implementing some of the incredible strategies revealed in this unique resource. This is CLEARLY the ultimate resale rights blueprint for any online marketer to make easy predictable money from resale rights. I take my hat off to you once again Ewen. Thanks! "More Ideas Than I Could Imagine!" Hi Ewen, what an E-book you have created! "Resale Rights Secrets" is the best book I've read on resale rights. I came away with more ideas than I could imagine. I can tell you did your homework. Congrats! "Powerful Secrets Revealed Even In The First 10 Pages..."
WOW!! This is the first report in ages that has had me hooked from beginning to end on the first read. I just couldn't stop reading. How anyone can possibly fail to succeed after reading this information would be a complete mystery to me. Within the first 10 pages I was scrambling for my notebook, my head buzzing with ideas, and action plans. "Personally Used These Techniques With Success!" I have personally used over half of the techniques in the book, with success! It's always nice to read advice that you know works, because you're doing it. I must say that this book will assist anyone in aquiring, selling, and profiting from resale rights or any other product! "You've Really Spilled The Beans Here!" Ewen, You've produced another winner with "Resale Rights Secrets"! 19 resale rights experts 'spilling the beans' on their very best, down and dirty techniques for making real profits in as little as 72 hours ... And the beans certainly do spill! I've certainly picked up some superb new techniques that without doubt will be helping me to make greater profits from resale rights in the future! Download "Resale Rights Secrets" Now!! has inherent risk for loss of capital. Copyright © 2004 Resale Rights Secrets.com. All rights reserved.